World Kicks is a 4 player (linkable to 8 player) game with a completely intuitive control system. The players use an analog joystick to control their characters position on the field and to decide what direction to pass or shoot the ball. Instead of an elaborate collection of buttons to activate shots, World kicks uses a soccer ball, mounted to the bottom of the cabinet. Each player has his own ball, which reacts to the strength of the player's kick. A soft touch results in a soft pass. In order to simplify the game play, World Kicks is fashioned after the international game of Futsal or 5v5 soccer. With one cabinet, players can play with any combination of the four positions. Players can play cooperatively against the computer or any combination of head to head. With 2 cabinets linked together, players can control all 8 of the active field players for incredible 4v4 action. Players choose the country they wish to represent, and square off for the World championship. World Kicks is a 4 player (linkable to 8 player) game with a completely intuitive control system. The players use an analog joystick to control their characters position on the field and to decide what direction to pass or shoot the ball. Instead of an elaborate collection of buttons to activate shots, World kicks uses a soccer ball, mounted to the bottom of the cabinet. Each player has his own ball, which reacts to the strength of the player's kick. A soft touch results in a soft pass. In order to simplify the game play, World Kicks is fashioned after the international game of Futsal or 5v5 soccer. 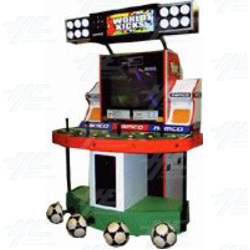 With one cabinet, players can play with any combination of the four positions. Players can play cooperatively against the computer or any combination of head to head. With 2 cabinets linked together, players can control all 8 of the active field players for incredible 4v4 action. Players choose the country they wish to represent, and square off for the World championship.